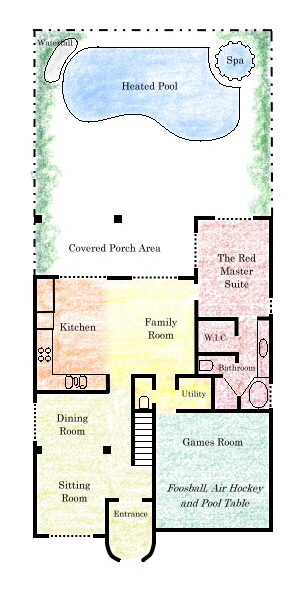 The floor plan is shown here so that you can see if the accommodation will suit everyone in your party. The ground floor (image on the left) is where all the living accommodation is found, plus one of the master bedrooms. The remaining sleeping accommodation is on the upper floor. The bedrooms are arranged as follows, sleeping two people to a room. Two very good quality air beds are available for extra children by prior arrangement only. 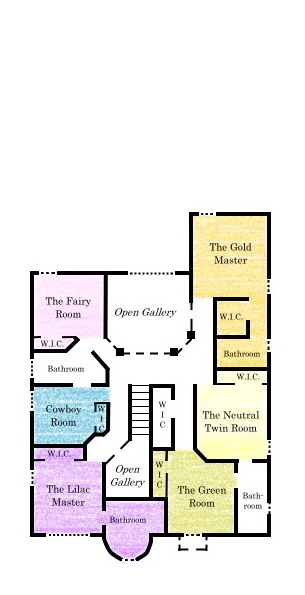 The Fairy Room is a twin room with four poster beds and shared en suite bathroom (with The Cowboy Room).